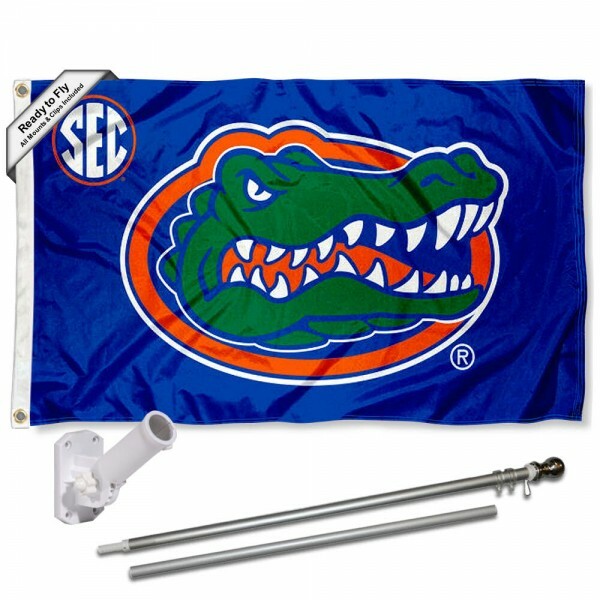 Our Florida UF Gators Flag, Bracket, and Flagpole Kit includes our 3x5 foot NCAA Officially Licensed Flag, Aluminum 6' Flagpole - Heavy Duty, and Aluminum Adjustable Flag Bracket. These are the recommended accessories to fly this 3' x 5' flag. The flag is made of single-ply polyester, is 3x5 feet in size, has four-stitched flyends for extra durability, two metal grommets with canvas header, and the school athletic insignia, letters, and logos are screen printed. Since this flag is 1-ply, the team logos are a reverse image on the opposite side. The included spinning 6' pole is our Aluminum 6' Flagpole - Heavy Duty which is made of two-piece aluminum and includes all flag mounts and clips for attaching many styles of flags. In addition, our Aluminum Adjustable Flag Bracket is included which is made of rust resistant aluminum and adjusts from 0 - 180 degrees so flying your flag at any angle is possible. This Florida UF Gators Flag, Bracket, and Flagpole Kit is a great gift and all hardware is included so It's ready to install and to fly proudly!